is there such a thing as a tattoo that isn’t a virtue signal? @liaizon My first was a 'pirate fish' that was loosely related to the whole Flying Spaghetti Monster thing. It was a subtle way of signaling my atheism. Every time I wanted to add another tattoo I ran into paralysis analysis - it had to *mean* something, and needed to mean something forever. 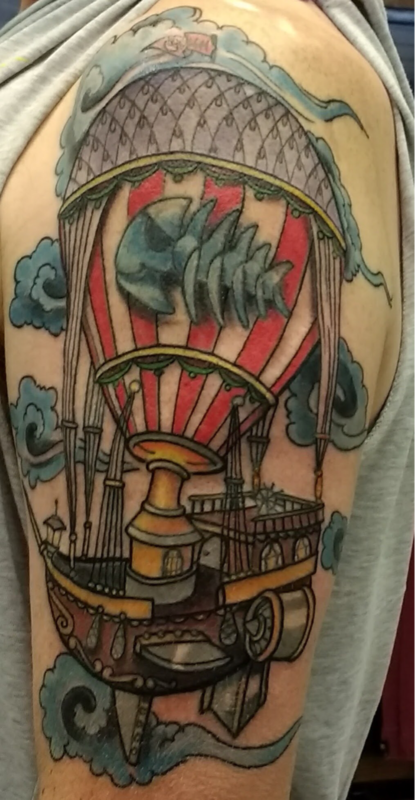 Ten years later I finally I broke free and had the fish incorporated into a half-sleeve of pure fun/silly steampunk art, a pirate airship. Attending tattoo expo in May for 'my next tattoo' ideas. @donblanco @liaizon It fits pretty well! @donblanco @liaizon Thanks for sharing!